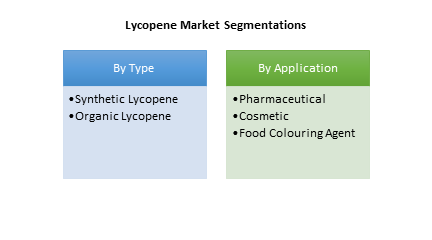 The global Lycopene Market is estimated to surpass $133 Million by 2023 growing at an estimated rate of more than 3.5% during 2018 to 2023 majorly driven by rising demand for natural colorants in ready to eat food products and the growing utilization of carotenoids in cosmetic, food and pharmaceutical industries. Lycopene possess several positive health effects on immune and cardiovascular systems and it’s also used to treat several diseases such as human papilloma virus infection, asthma, gingivitis etc. Lycopene is present in tomato species known as Solanum lycopersicum, mostly found in Central and South American regions. It is a carotenoid and phytonutrient substance, and is an essential antioxidant for human body which helps in protecting from degenerative diseases. Majorly lycopene is found in red fruits and vegetables such as tomatoes, watermelon, papaya, guava, sweet red peppers, mango, carrots, red cabbage, and pink grapefruits. It has a number of health enhancing nutrients which contributes in preventing few forms of cancer and to maintain a healthy heart. Lycopene also contributes in aiding oxidative stress that causes common eye diseases and is one of the best natural vitamin which would help the eyes. This also helps in protecting age-related macular degeneration, a form of blindness which affects the elderly. What are the major applications for Lycopene? The various end user applications assessed in the report includes pharmaceutical, cosmetic, and food coloring agents. Continuous growth in the food and beverage industry along with the natural health benefits associated with the Lycopene would be driving the Lycopene market during the forecast period. As of 2017, the food and coloring agents segment dominated the market with a majority share. This dominance is anticipated to continue during the forecast period. The increasing research activities intended for the development of anti-cancer drugs is anticipate to drive the market to a larger extent during the forecast period. The research and development activities majorly depend on the organic form of Lycopene given the lower risk involved in development. The tomato department of Stazione Sperimentale per l'Industria delle Conserve Alimentari (SSICA) recently developed a standard for accelerated extraction and determination of lycopene in tomato products. This includes fresh matter, juices, purees, pulp, concentrates and sauces. The new method developed is an accessible, rapid and reproducible analysis utilizing accelerated solvent extractor equipment with tetra hydro furan solvent in proper conditions. This method enables a rapid, precise and reproducible analysis and will be useful in terms of solvent and time saving and high automatism with high precision results. The major benefits of Lycopene are that it protects from DNA damage, improves prostate health conditions. It also proven to decrease the PSA levels. The lycopene ingibits prostate gland enlargement and also provides skin protection. In-addition to the above it also improved the bone health and controls hypertension. Given the increasing research on the benefits for health care, the pharmaceutical based applications are increasing immensely. Who are the Major Players in Lycopene market? The companies referred to in the market research report includes BASF SE, Royal DSM N.V., Hoffmann-La Roche Ltd, General Nutrition Center, Shaanxi Huike Botanical Development Co. Ltd., Lycored, Jamieson, NBTY,Kagome,Bayer AG and more than 15 other companies. 14.6. Shaanxi Huike Botanical Development Co. Ltd.